Hi Jason, ha ha, its always when we develop this new, amazing API that solves all the problems with the old Api when someone finds a flaw and wants to push it further … I don’t think this will be very easy with CompositeAnnotation, because we didn’t design it for multi click creation and editing. However … It might be possible by creating a FrameworkElement and overriding OnRender and placing that inside a box annotation. I’ll talk to the team tomorrow and see if we can brainstorm this. Would love to solve it for you! As of SciChart WPF v5.2 we now natively support multi-click annotations in the SciChart.DrawingTools package. Please see the release note here. I managed to come up with a solution which turned out to be a great exercise in what it truly possible with the ChartModifierBase class. The full source for XABCDModifier is attached but I want to highlight a few points for readers. The code snippets below are not all of the class but merely the high points. I’ve documented the attached code really well for clarity. – Quick to create for the user. – Fully utilize SciChart’s surface calculations for panning, zooming, etc. – Move with the data series. – Be placed anywhere on the visible chart. – Serve as a template for other annotations which I may want to “link” in the future. – Point must be editable without breaking the pattern (lines stay connected or “linked”). – Uses double click to activate and deactivate (primarily for testing, needs to be data bound in production so something which won’t interfere with other modifiers). – Uses a temporary storage of Dictionary<string, AnnotationBase> for easy access. – Uses the Tag property for distinguishing these annotations from independent annotations created later. There’s definitely nothing Earth-shattering here and this is not how I’d do this in production. Enabling and disabling here is achieved by a simple double click which is very convenient for testing and keeping the modifier free from external dependencies. /// This overridden method is only used to activate/deactive the modifer for testing purposes. /// In a production setting, this modifier will need to be activated via a view model based on appropriate criteria. In my opinion, a complete user experience can’t be achieved without handling key presses so I implemented a few. The escape key was originally used to serve as a short circuit during testing and should probably remove the entire pattern but here it just stops drawing. The rest of the code here is pretty self-explanatory. /// Called when the KeyDown event is fired for the Master of the current <see cref="P:SciChart.Charting.ChartModifiers.ChartModifierBase.MouseEventGroup" />. /// Used during testing environment to stop creation without a mouse action. Here is the meat and potatoes of my solution. I’ll go over the helper methods below. Here’s the full OnModifierMouseDown override. First, I make sure I’m in draw mode which is set in the OnModifierDoubleClick. 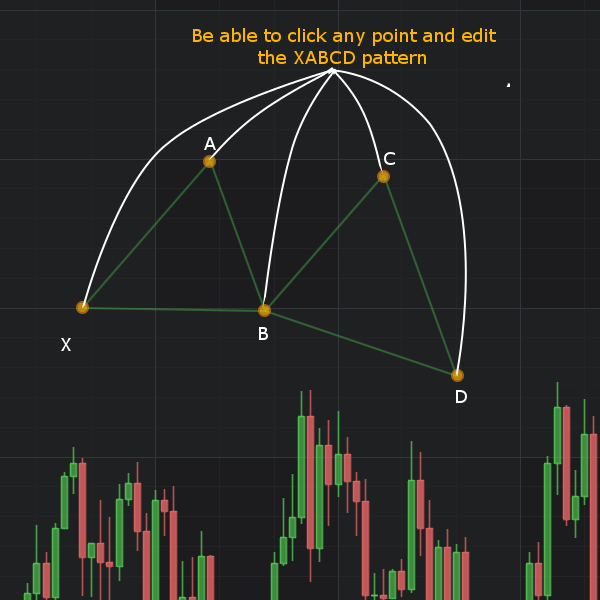 Once I’m drawing, there are 2 cases with a XABCD pattern. The first is just drawing the simple lines which are XA, AB, BC, and CD. Once those have been drawn, I now have a line count of 5. It’s 5, not 4, because I’ve already started drawing the 5th line but just haven’t place it yet. Once I’m at this point, I don’t want to try to precision click the DB and BX lines since I can easily get the B and X points from previously drawn lines (this is why I store them in _linkedLlines). Therefore, I just create the next line which is BX then start placing and binding the remaining points. /// This is the primary method for utilizing this modifier. Of note here is if (_linkedLines.Count == 5) since this allows me to finish the XABCD pattern programmatically instead of trying to precision click. The data binding of the points for the last 2 lines is a little different so I handled those individually. Adding a new line. Self explanatory but important if you want to see your work. /// The _linkedLines dictionary is used to allow connecting non-consecutive annotations in a group or pattern. /// _linkedLines dictionary is cleared after the XABCDModifier is deactivated. This is by far the most crucial piece of making this work with annotations. This method works for the XA, AB, BC, CD lines then I manually handle the DB and BX lines in the Count == 5 case. This method is best thought of as reading the parameters from left to right. Bind TARGET’s TARGETPROPERTY to SOURCE’s SOURCEPROPERTY. I tried using BindingMode.TwoWay but it didn’t work as expected so below is what did work. /// Creates the data binding. /// To prevent annotations from separating, call this function once for each annotation's properties, i.e. line1's X2Y2 and line2's X1Y1. /// This will allow either annotation itself, or adorner handles to be selected and still keep the annotations connected. Creating and completing pattern legs is fairly straightforward but it has some built in “gotchas” that I encountered. When creating an annotation, you must set all coordinate properties ****before**** it may be added to the ParentSurface.Annotations collection. In a slight of hand, I just set both sets of X and Y to the current mouse point position since I’ll just turn right around and update X2Y2 in OnModifierMouseMove. This allow me to create the annotation and receive the real time visual feedback when placing the end of the line. Naming the lines is a simple switch statement that is hard coded. /// Creates the new line. /// from other annotations in <see cref="T:SciChart.Charting.Visuals.SciChartSurface.Annotations"/>. /// When utilizing from another class or resource, the Tag property must be explicitly casted to a string. /// that specifies the type of annotations this modifier should create. 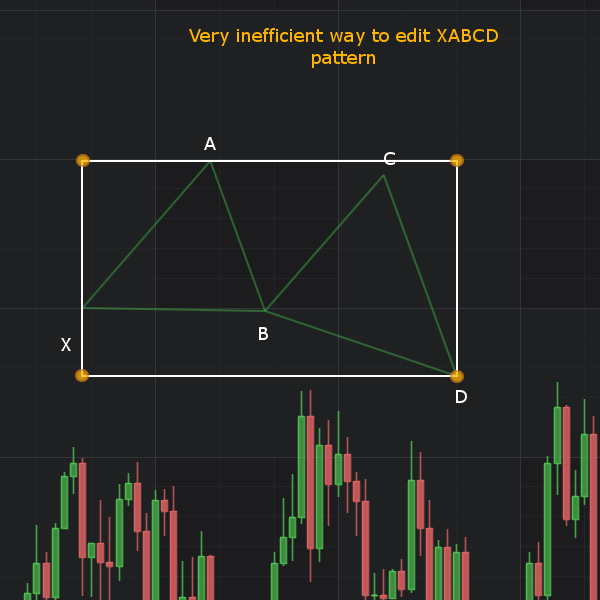 Hopefully this will help the SciChart community as much as it has helped me. This was an awesome experience and really forced me to understand the SciChart API. Also, a big thanks to @Andrew for helping me avoid going down the rabbit hole of trying to do this with a RenderableSeries since I’m using CategoryDateTimeAxis (CDTA requires a 1:1 point count for any additional series even XyDataSeries).